Bruce covered the song 9 times from 1974 till 1980 : Done in monologue fashion that built the song. Mostly used as an introduction to 'Cadillac Ranch'. played at full : billing extravaganza, with Springsteen & The E Street Band headlining. Support acts were Michael Stanley, The Banky Brothers Band and 15-60-75 (aka The Numbers Band). played at full : noted on the pre-concert advertising material, singer-songwriter Jeffrey Comanor opened for Springsteen, performing a short set. "No Money Down" is used for the first time as an introduction to "Cadillac Ranch"
used as introduction to Cadillac Ranch. The introduction was fuller than the night before. "Cadillac Ranch" again features the "No Money Down" introduction, which is now almost a full song. Cadillac Ranch starts now off with only a few lines from "No Money Down"
"No Money Down" is a song written and recorded by Chuck Berry in December 1955. 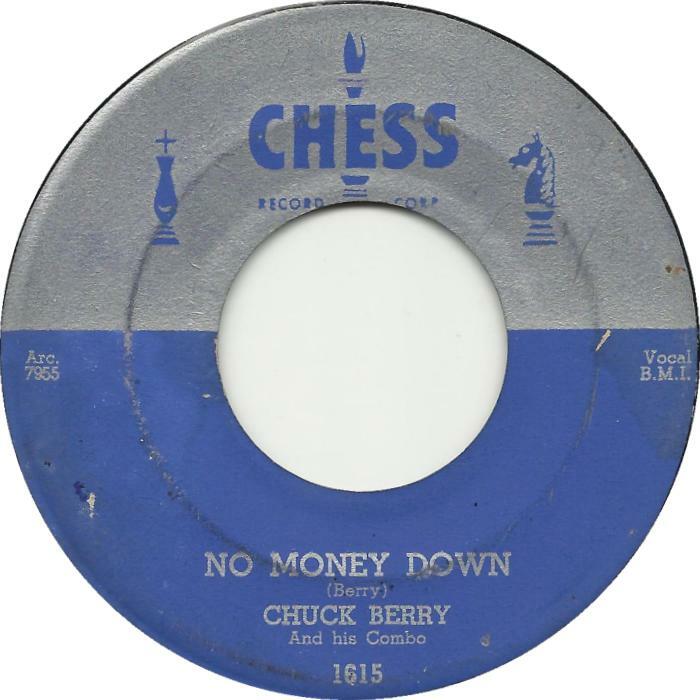 "No Money Down" features a repeating stop-time riff similar to the one that had previously appeared in Willie Dixon's "Hoochie Coochie Man", Bo Diddley's "I'm a Man" and Muddy Waters's "Mannish Boy". It tells a story, in great detail, of a man who enters a Cadillac showroom to trade in his Ford. "We flew into town...sat down in my room, turned on the television set...on came a fella by the name of Tex Earnhardt...and Tex wanted to sell me a car...well I shut off the TV...and I laid down to get some sleep...but, I had a dream...you see, I was motivatin'...back in town...I saw a big Cadillac sign, it said no money down...I eased on the brakes...I pulled in the drive...I gunned my motor twice, then I walked inside...well Tex said to me, he said "Boss! Trade in that Ford, and I'm gonna put you in something that's gonna eat up the road. Now just step over here and sign your name right on that line, and I'll bring it over to the old motel in just, in just two hours time..." Well I said "Tex! I want a yellow convertible, four-door DeVille, a Continental spare...and wire chrome wheels. I want air conditioning, and I want some automatic heat now, and a full fold-out bed...in my back seat. I want a TV, a stereo, a eight-track tape deck, and I want a 'phone...so I can talk to my baby "
I want thirty thousand liability"